1 What is The Berger Inquiry? What is The Berger Inquiry? The Canadian Parliament established the Berger Inquiry on March 21st, 1974 to review plans to build an oil and gas pipeline down the Mackenzie Valley. This inquiry was commissioned by the Government of Canada to investigate the social, environmental, and economic impact of a proposed gas pipeline that would run through the Yukon and the Mackenzie River Valley of the Northwest Territories. This proposed pipeline became known as the Mackenzie Valley Pipeline. The inquiry cost C$5.3 million, and produced over 40,000 pages of text and evidence, comprising 283 volumes. The commission recommended that no pipeline be built through the northern Yukon and that a pipeline through the Mackenzie Valley should be delayed for 10 years. Read more information about the Berger Inquiry at the Indigenous Foundations (Special Projects) and the Berger Inquiry project site. In 1974, Justice Thomas Berger decided the future of the largest construction project in Canadian history — a pipeline down the Mackenzie Valley. Now, we ask you to put yourself in the Judge's chair. Read the evidence and decide what Canada should do. To further engage with exhibit themes, please consider attending a plenary session with Glen Coulthard, Julie Cruikshank, and Alestine Andre on Tuesday, November 13th. More details to come! If you have additional questions, contact Natalie Baloy (ubc-mix@interchange.ubc.ca). From Oct. 29 to Nov. 13, curator Drew Ann Wake is leading guided workshops of the INQUIRY exhibit. The workshops are tailored to address course objectives and student interests. During the workshop, Drew Ann provides a basic overview of the 1974 Mackenzie Valley Pipeline Inquiry (also known as the Berger Inquiry). She 'introduces' students to individuals who were involved in the Inquiry by showing their portraits (on display in the exhibit) and sharing audio recordings from their testimonies. Participating students are each matched with an individual who participated in the Inquiry. After reading a short statement from their assigned individual, students then discuss the pipeline project together and debate whether or not the pipeline proposal should be approved or not, and why. Each student then takes the position of Judge Berger and recommends a course of action in regards to the pipeline proposal. These workshops are intended to reveal the complexities and nuances of the Berger Inquiry, and to encourage students to think critically about the diverse perspectives that shaped the Inquiry and influenced Judge Berger's decision to reject the pipeline proposal. Engaging with the INQUIRY exhibit provides students with a grounded case study of community consultation, policymaking, and sustainable development negotiations. Individuals who were involved with the Inquiry are also available to meet with students and share their experiences. November 9, 12:30pm to 2:00pm, Forum Drop by The Forum for coffee and an informal chat with the curator of the Inquiry exhibition. After graduating from UBC, Drew Ann Wake covered the hearings of the Berger Inquiry for the CBC. Over eighteen months she travelled to communities along the Mackenzie Valley and around the Beaufort Sea, "the best first job on earth". She now leads LiveWires Design, a company that builds educational computer games. November 13, 9:3 am to 11:30am, First Nations House of Learning The First Nations House of Learning will host a panel discussion "Passion for the Land: Traditional Knowledge From the Past - For the Future". Panelists include Alestine Andre from the Gwich'in Social and Cultural Institute (Tsiigehtchic, NWT); Gabrielle Mackenzie-Scott of the Centre for Indian Scholars (Yellowknife, NWT); Julie Cruikshank of the UBC Department of Anthropology, and Glen Couldhard of the UBC Department of Political Science. The talks will be followed by a question period and refreshments. November 13, 9:30am to 11:00am and 1:30pm to 3:00pm, Forum Classes of students from Windermere Secondary School will engage in the hands-on history activities in the Inquiry exhibition. They will be asked to "put themselves in Judge Berger's chair" by reading the evidence and debating recommendations. Thomas Berger and lawyers who served as counsel at the Inquiry will drop by to coach the students. Visitors are welcome to observe. 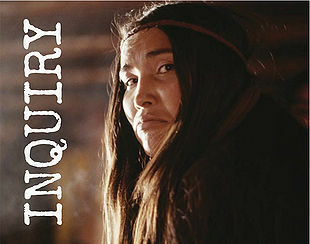 November 13, 12:30pm - 2:00pm, Indigenous Classroom Professor Michael Jackson of the UBC Faculty of Law and John T'Seleie from the NWT Department of Aboriginal Affairs and Intergovernmental Relations will show a segment of the 1977 documentary, The Inquiry Film, in which they both appeared. This will be followed by a discussion of land settlement agreements in the Northwest Territories and a question period. November 13, 3:30pm to 5:00pm, Forum As a young man, Dr. Patrick Scott went to the Northwest Territories as the cameraman for the CBC during the Berger Inquiry. He will present a slide show with the voices and photos from the community hearings. After participating in the hands-on history activities, Patrick will take audience questions about the impact of the Berger Inquiry today, on the 35th anniversary of its report. November 13, 6:00pm to 8:00pm, Forum The Inquiry exhibition will be formally launched with a reception (by invitation) at 7:00pm Thomas R. Berger will speak briefly. Abele, F. (1983). The berger inquiry and the politics of transformation in the mackenzie valley. The unusual prominence and resonance of the Berger Inquiry into the construction of a Mackenzie Valley pipeline may be explained by the Inquiry's role in the transformation of the fundamental social relations of native societies in the Mackenzie Valley. The Berger Inquiry period comprises one crucial phase in the long process of transformation which began when native societies were first contacted by emissaries of European capitalism during the eighteenth century. Successive exogenous influences shaped changes in Mackenzie Valley social relations, but these influences did not decisively draw the Dene into capitalist society. The expansion of the Northwest Territories regional government and the post-Prudhoe Bay oil rush in the late 1960s threatened to achieve this resolution, by legally and practically separating the Dene from the material basis of non-capitalist productive activity--that is, from the land. Apprehension of this prospect, together with new opportunities for communication and organization (provided by the Berger Inquiry and in other ways) prompted the self-organization of Mackenzie Valley native people and their emergence into modern 'politics'. The details of this process, and of the Inquiry's influence, are explored at length. A subsidiary theme of the thesis is that certain analytical tools developed by Karl Marx in his study of the emergence of capitalism in Europe may be used to comprehend both the transformation of Dene social relations, and the role of the Canadian state in this development. A general conclusion is that because the Dene confront a liberal democratic capitalist state, they may build upon the basis of traditional social relations a new society which preserves significant elements of older ways, including a special relationship to the land. Butorac, A. V. (1977). Educational implications of vernacular language claims as reflected in the berger inquiry. Cargill, S. V. (2002). The berger inquiry revisited: The meaning of inclusion for the inuvialuit. The well-publicized Berger Inquiry, and its final report published in 1977, sought public opinion on the consequences of construction of a Mackenzie Valley pipeline. It marked an important moment in Canadian political history, as it diverged from the historical pattern of northern resource development by actively seeking the opinions of northerners, especially northern native peoples. This thesis considers the specific case of the Inuvialuit and the implications of their participation at the Inquiry. It suggests that while Berger's recommendation for a moratorium on construction of a northern pipeline was not the determining factor in the decision against pipeline development, the Inquiry still carried significant influence as a process that fostered communication of native goals for land claim settlements and greater self-determination. The main archival sources were transcripts of the hearings, other Inquiry papers, northern native newspapers, House of Commons Debates, and government documents. The Inquiry is criticized for its analysis of the Inuvialuit position as being in opposition to pipeline development, and it is suggested that instead Inuvialuit expressed a wide range of opinion, including interest in large-scale development. Although their culture and northern economy rested on a land relationship, this fact of northern culture did not necessitate opposition to oil and gas development. Rather, the subtleties of the Inuvialuit position prepared the way for a new and integrative approach to northern resource development, with implications for Canada's evolving political practices. Thus, the Mackenzie Valley Pipeline Inquiry should be seen as a process that allowed for native participation on their own terms, and not simply as an exercise in coercion by southern culture. Gamble, D. J. (1978). The berger inquiry: An impact assessment process. Science, 199(4332), 946-952. doi:10.1126/science. The Mackenzie Valley Pipeline Inquiry, conducted by the Honorable Mr. Justice T. R. Berger, undertook to explore thoroughly the issues surrounding the building of a northern pipeline. In doing so, the Inquiry provided a forum for the interplay of the technical and environmental issues with very personalized social and cultural concerns. As a process, it reached out beyond the direct participants: it became one in which all Canadians, north and south, participated. It touched some of Canada's deepest concerns-concerns about energy policy, resource allocation, the price and priority of industrial development, cultural sovereignty, and self-definition. These have become national concerns, not just regional. And so, no matter what the final decision is about the pipeline, the Inquiry will have a profound and lasting national influence. Hopson, E. (2004). A voice from the past [testimony to the berger inquiry, 1976]. Northern Perspectives, 29(1/2), 7. O'Malley, M. (1976). The past and future land: An account of the berger inquiry into the mackenzie valley pipeline. Toronto: P. Martin Associates. Lesson Plan: Who Gains from the Pipeline?